We had the pleasure of visiting Castillo de San Marcos in St. Ausgustine FL! 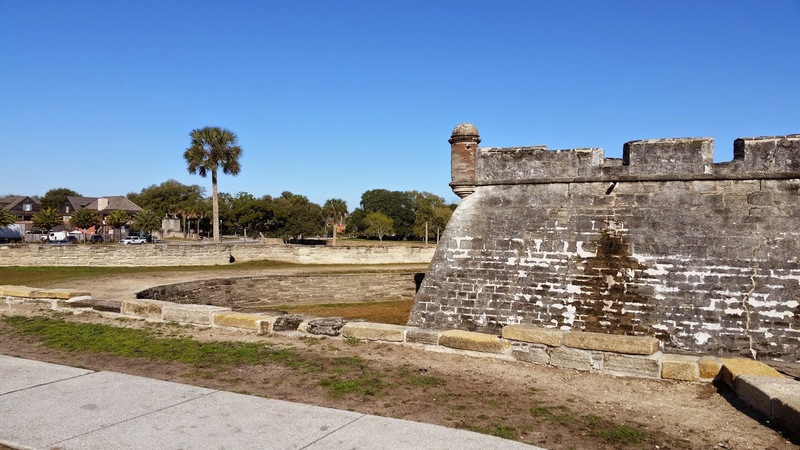 "The Monument site consists of 20.5 acres and includes a reconstructed section of the walled defense line surrounding the city of St. Augustine incorporating the original city gate". The pricing is very reasonable with kids entering for free and adult tickets are around $7 each. This "Castle" as Mac calls it is a pure work of art. Each wall, step and ceiling is hand crafted and made from the late 16-17th century era. This is enjoyable for both adults and children because there is something for everyone. History, military devices, powder rooms, cannons and more! "The Spanish colony of St. Augustine was founded in 1565; 42 years prior to the founding of Jamestown and 55 years before that of Plymouth". The views from the top deck of the fort are beautiful from all sides and angles. I love this Old Historic Town and this fort just adds the old world charm that really is hard to capture with words. learn different tales from past battles. It was windy on our visit but since you gain 3 day passes at no extra charge we can always return within 14 days. If you are interested in a inexpensive, activity for your family this is a great option. They run Ghost walks and tours in the night time as well. We will be in Florida a few days and I wanted to share some of our travels, favorite spots and points of interest. I'm going to New York for the first time in my life next week for a vacation. So excited!! My husband and I went here many years ago and it's beautiful! You did a great job with this post! And PS - I'm also from WNY - I was born and raised in Cheektowaga and moved to Tampa in 2007! I went to St. Mary's HS in Lancaster and then Daemen College in Amherst! Love meeting bloggers who live in WNY!!! I grew up visiting heaps of castles here in the UK have some lovely memories with my family and some not so lovely ones too like when I tried to give myself concussion!